The researchers found that protein in cells acts as it normally does, but it also helps the cell maintain its shape, and is therefore also a structural protein. This is something that has never been discovered before (Go Cougs!). “This is an eye opener for people working in the field,” David Liu said in a WSU news release. 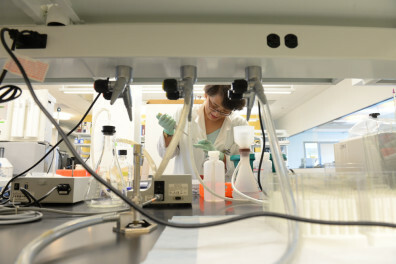 Liu is a member of the research team. Liu and five others in the College of Pharmacy teamed up with researchers from Penn State, the Chinese Academy of Sciences, Zhejiang Sci-Tech University and the University of Texas to conduct this study, which was funded in part by the American Cancer Society and Department of Defense. This discovery may fly over the heads of non-sciences folks, but cell structure is vitally important for our health. Malformed cells can lead to the development of tumors and other medical conditions. Knowing that protein helps cells keep their shapes means we can open doors to further discoveries. Fewer tumors, for example, may someday be a reality. And it all started with a team of scientists that included ones from WSU Spokane. Grants and contracts are awarded quite often, and the latest quarter’s grants and contracts awards summary is available. Here are past reports. Some notable grants and contacts recently include one for our researchers in the criminal justice program on campus. Lois James and Bryan Vila will study the effects of fatigue in police officers in Canada in order to create policies and procedures that take into account fatigue effects (there it is – solving a problem!). Marcos Frank in the College of Medical Sciences received a grant to continue his research on REM sleep. Julie Postma in the WSU College of Nursing received a grant to continue work to improve the quality of life of those in the Puget Sound area that have asthma. There are a lot of other grants awarded to our faculty. All aim to solve problems. As the lead story showed, it takes a big team to make scientific discoveries. The College of Medical Sciences has a blog (which you should subscribe to, after subscribing to this one) that highlights how a research team operates. As the blog post states, research teams need people to write, analyze data, work in the lab, and more. One person alone can’t be successful. So when we share our research news, be aware that a large, smart team made it all possible.